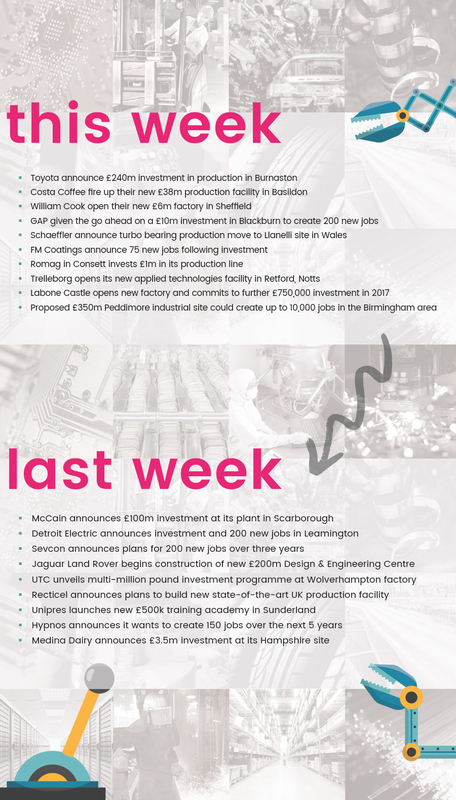 It’s been quite a start to the month for UK manufacturing and the first couple of weeks of March was packed with many fantastic news stories from across the country announcing investment, growth, new jobs and expansion. It can be hard sometimes to keep up with all the positivity amongst chatter of Brexit etc, so we thought we’d try and capture some of the great positive news in one place. The below is by no means an exhaustive list but we feel it does show how positive manufacturers are currently. It also doesn’t take into account all the focus and positive messages promoted by manufacturers around National Apprenticeship Week and International Women’s Day during w/c 6th March. We all need to keep promoting how positive the sector is and continue to highlight the great future the sector has. We hope you find the graphic below interesting.